Fiction was represented by Haruki Murakami‘s famous book Norwegian Wood. Nice review on Norwegian Wood was written by Ben Casnocha, you can read it here. 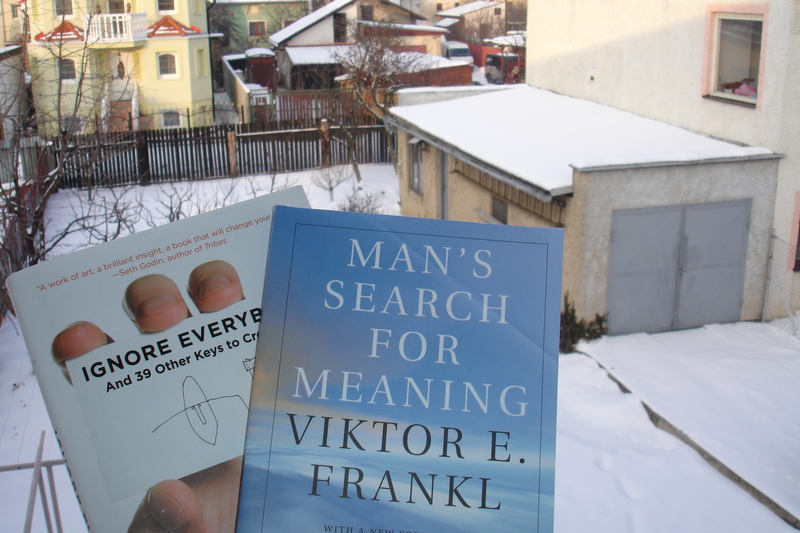 The “winners” for the quotes of the month, are Hugh MacLeod with Ignore Everybody and Viktor Frankl with Man’s Searching for Meaning. Hugh’s book is already fully reviewed in the blog post (sorry in Slovak), here. But I don’t want to neglect YOU, my readers, so here are few more bonus quotes by Hugh, which are not mentioned in Slovak review. The person you trust and vice versa are what will feed you and pay for your kid’s college. Nothing else. Wanting to change the world is not a noble calling, it’s primal calling. Guys, I beg you to follow Hugh’s gifts to the world via following his blog. Hugh will help you to remember WHO YOU ARE, which is also his latest give away cartoon. Viktor Frankl and his book was sold ” quite a lot” > over 12 million copies sold;-) Let me share with you quotes, what Frankl’s readers might get hooked up with too. Don’t aim for success, the more you aim at it and make it a target, the more you are going to miss it. Success is by-product of one’s surrender to a person other than oneself. Love is the ultimate and the highest goal to which man can aspire. There is no need to be ashamed of tears. Weep it out of the system. Everyone’s task is unique as his specific opportunity to implement it. The wish is father to the thought, the fear is mother of the event. Things determine each other, but man is ultimately self-determining. The wish is father to the thought, fear is the mother of the event. Tinka thank you again for another comment. I appreciate your trust and loyality. Murakami! A real geek’s book! I met “A Wild Sheep Chase” first, and resolved straight away to read everything the man writes. I haven’t yet met up with Norwegian Wood, but it’s on the list. Thanks for the other recommendations – I’ll check ’em out. Thanks for tip, will certainly look at that one!